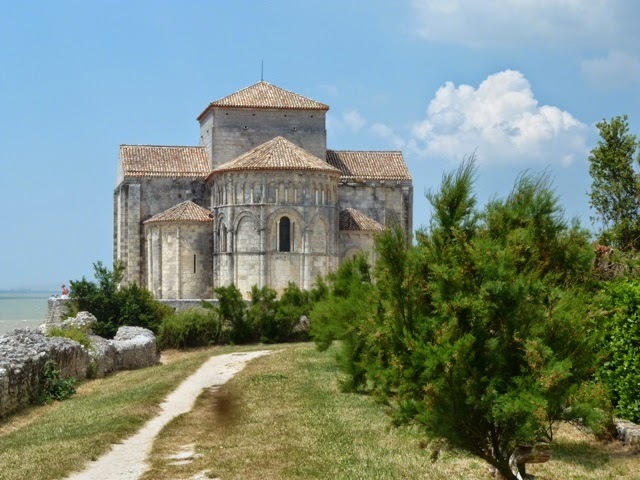 Carol and Graham's motorhome blog on places we have visited. A leisurely start to the day (again) - set off from Camping Les Castors at just after 11am. Score for Camping les Castors - 9/10 - a small ish site in a rural location a few minutes cycle from Jonzac,a lovely pool area,and a restaurant in a marquee serving local dishes if ordered the day before. 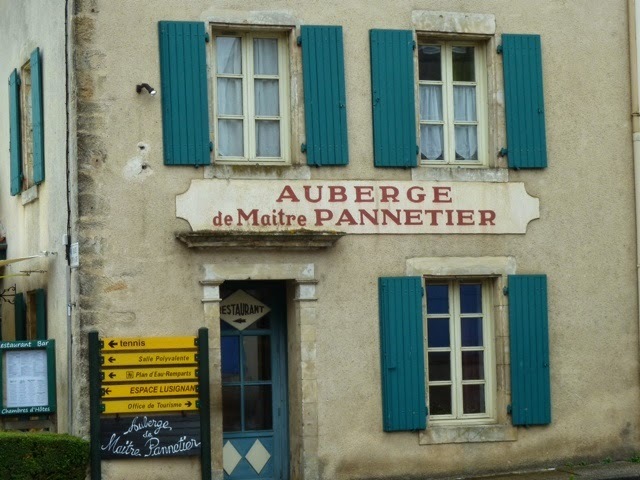 A shop for provisions at Intermarche meant we hit the road for our usual driving time between 12 and 2pm. We find this the best time to travel as the roads are empty with the french are off the road having lunch - mad dogs and Englishmen and all that. 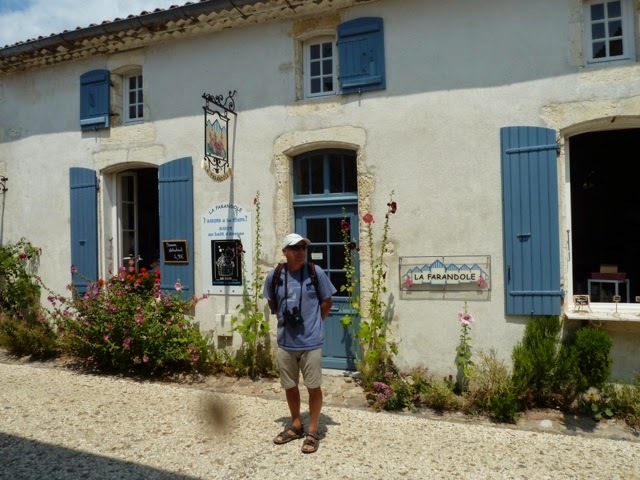 We lunched at an historic village -Talmont Sur Gironde which appeared well set up for visitors, - a massive 700 place car park was provided which all cars/vans had to park in - 3 euros for a campervan! The village appeared to be a picturesque tourist trap with lots of artisan boutique shops, restaurants and cafes. 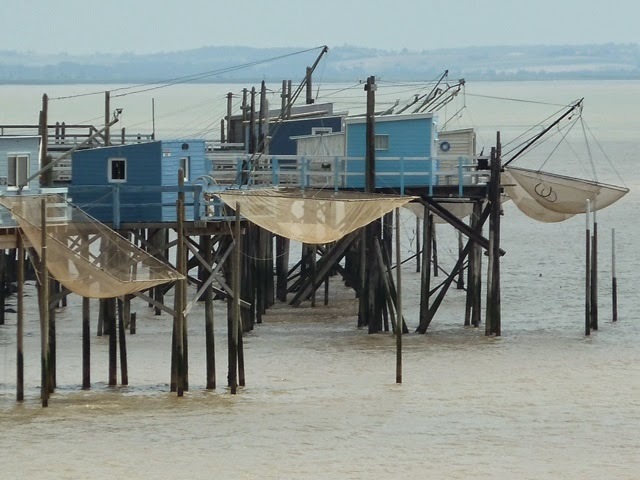 We picniqued overlooking the Gironde estuary and, further up the coast, Royan. 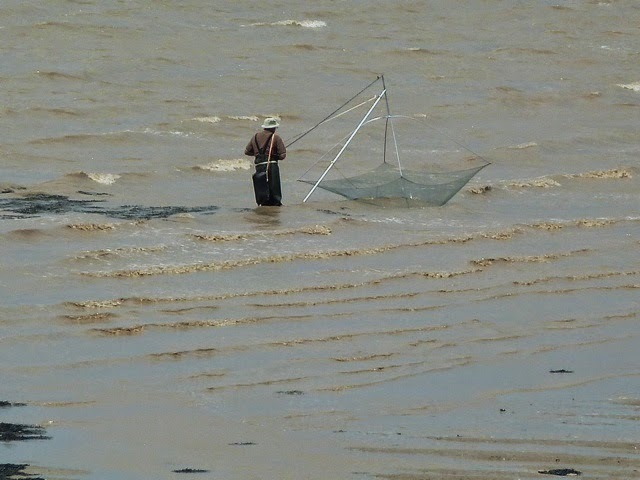 Fishermen were fishing with what looked to be large drag nets, of the same sort we see hanging from stilted huts in this area. They let the net sink to the ground, wait a minute or two and then bring it up to see if anything swims in. We're not sure what they are fishing for exactly but we did see one of them catch a little silvery fish. 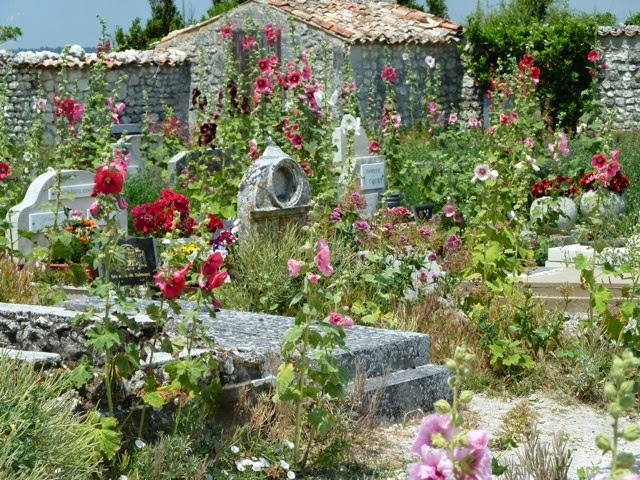 The village had an 11th century romanesque church, with the sea, slowly but surely eating away at the foundations, and graveyard full of hollyhocks. 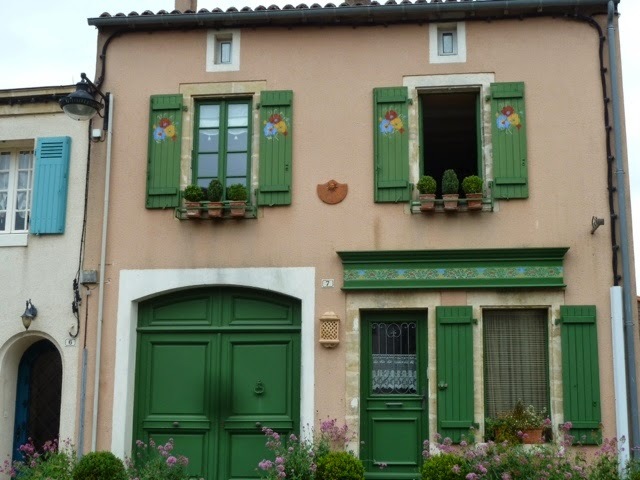 The village streets were pedestrianised - pretty houses surrounded by hollyhocks and other flowers - it was a bit like a stage set! Definitely a day trip place. 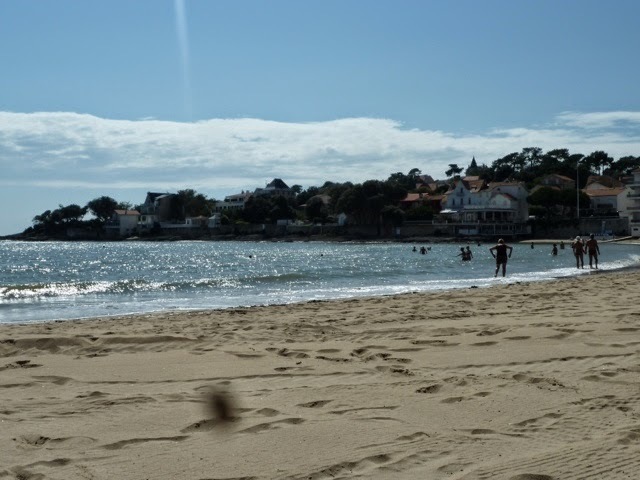 We continued on to Royan and chose to stay at Campeole Clairefontaine - situated in a residential area of North Royan which is within 500 metres of a beach and within walking distance to the town centre. We will explore tomorrow - today we hit the pool as usual once our pitch was sorted! We walked in to Royan late morning and were amazed how quiet it was - a sharp rain shower before we set off, our 1st since Normoutier! appeared to have put people off. Either that or they hadn't arrived yet. It feels very much like a seasonable seaside resort with no real heart that we could see. Most of the villas along the promenade appeared locked up. 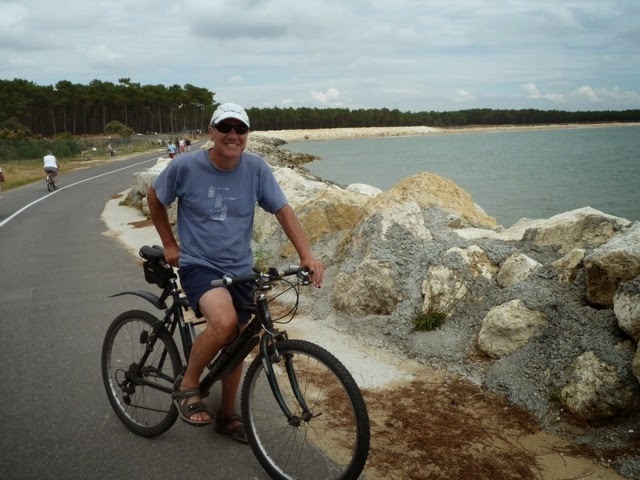 After lunch Chez Rex we decided to cycle to La Palmyre a resort north of Royan. A couple of decades ago we stayed at a campsite near there in a mobile home for a family holiday. Carol remembers being unimpressed by the area but we were surprised by how nice it appeared to be today. 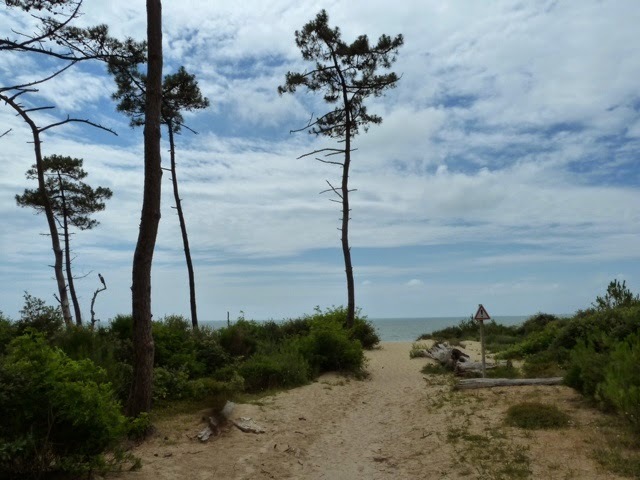 We cycled through a forested area of pine trees which led down to a continous stretch of beach - we can remember hiking through the forest from a car park with the children to discover the sand was too hot to stand on and then trudging back! Today it is still a bit of a climb down from the dunes to the beach -thank goodness Graham didn't have the camera as Carol attempted to climb/crawl back up! We continued on to the small harbour in La Palmyre watching people paraglyding with surf boards! - don't know what the technical term is. On our way back we spent time in St Palais sur Mer - a lovely small seaside village with a laid back vibe and much more character than Royan. Apologies but we appear to have a "floater" in the camera -so from now on you may see a dark smudge encroaching on the photos! 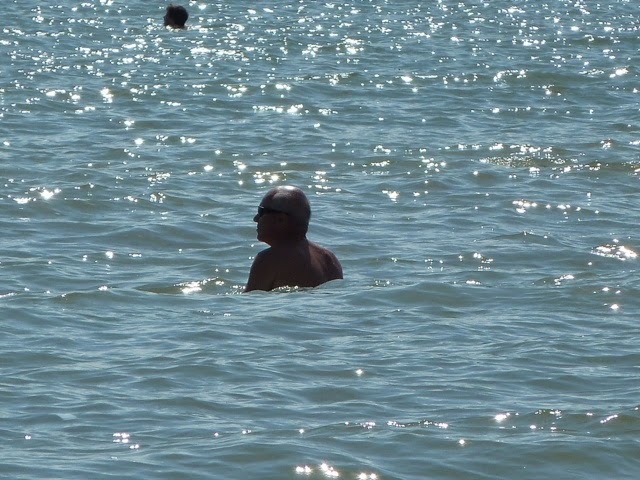 Graham even braved the Atlantic for a brief swim- Carol sensibly remained beachside. Again although some people were enjoying the sun it was not at all crowded - I bet come high season guess it's another story, when all those shuttered villas open. We are so impressed by the cycle paths in the area -you can literally cycle for miles along the coast. 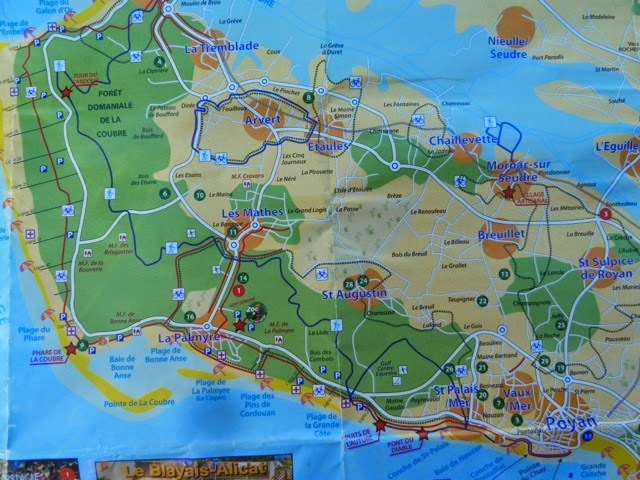 A cycle path called La Velodysee lasts for 41 kms - from Royan to La Tremblade !We travelled just 16 kms there and back today! La Palmyre looked like a great place for a family holiday. You can see from the map it is almost enclosed by sand, with beaches either side. 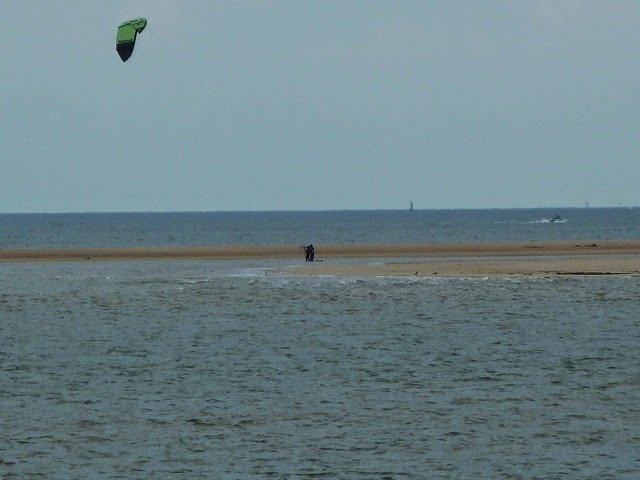 In the large bay are windsurfers, para-surfers and dinghys. With a sailing school based here too. If I were booking a holiday, I would head for St. Palais sur Mer., which has a fab beach and a dedicated cycle path to everything. Score for Campeole Clairfontaine 9/10 - another lovely pool area, good range of facilities and easy walking distance to central Royan. Usual laid back departure - 11ish. 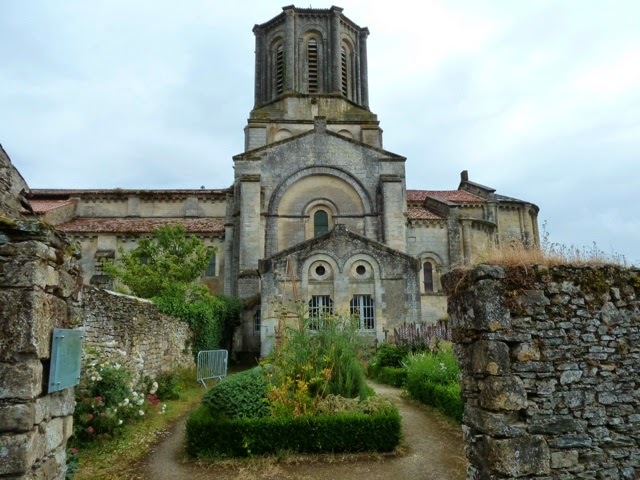 We travelled on to Fontenay le Comte - a town whose name conjured up more than it promised! We were impressed with aire for campervans on the outskirts, but a little disappointed with the town itself. A large town with long streets with bunting over promising something exciting which unfortunately did not deliver. Not yet anyway. We visited the Abbey church with the museum nearby but we were - underwhelmed -again! The highlight was going to the post office to get bonus stamps as Carol realised the recent stamps purchased were to use internally within France not to send to Angleterre. A keen post office worker spoke english and directed us to an automated machine which spewed out the stamps needed, therefore thwarting Graham of a complicated french speaking opportunity! Onwards to our campsite in the Mervent Forest- Camping La Joletiere - we were amazed how quiet the site was! Just us and another late arrival. 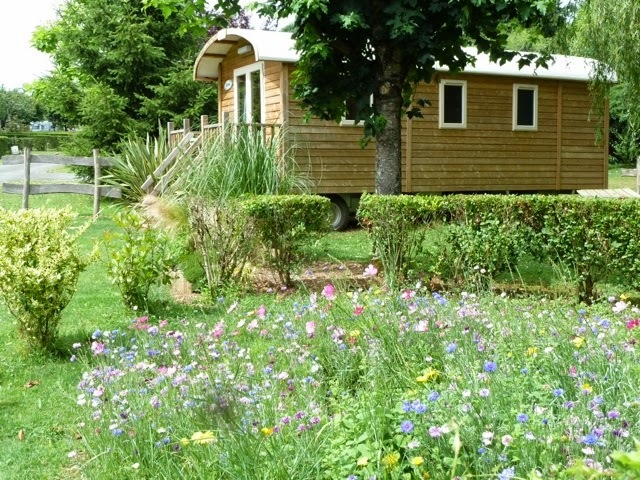 It is mostly a touring site with some rental properties - mobile homes, lodges, and this lovely gypsy type caravan. 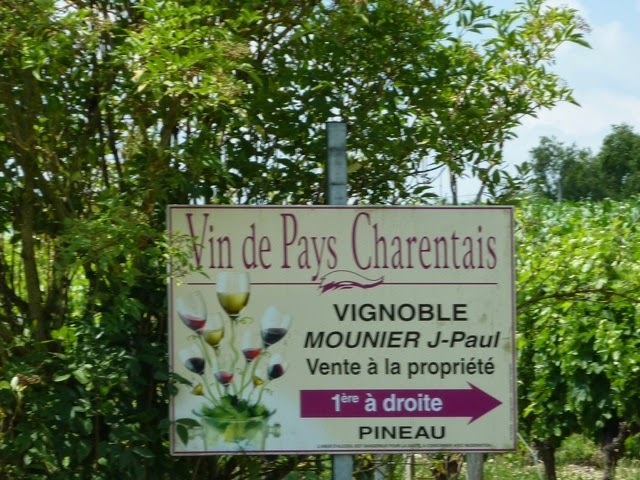 Tomorrow we hope to cycle through the forest to Pisotte - to sample some wine - again it would be rude not to sample local produce! - and then we hope to visit Mervent village. Today we awoke to the sound of rain battering on the roof of Rex. France Bleu radio station weather news declared there are warnings of storms and hail throughout France. We decided against a soggy cycle ride and alas no wine tasting. It makes sense to travel further north in the rain in the hope of sunny weather later, so we cancel tonight's stay and head off. 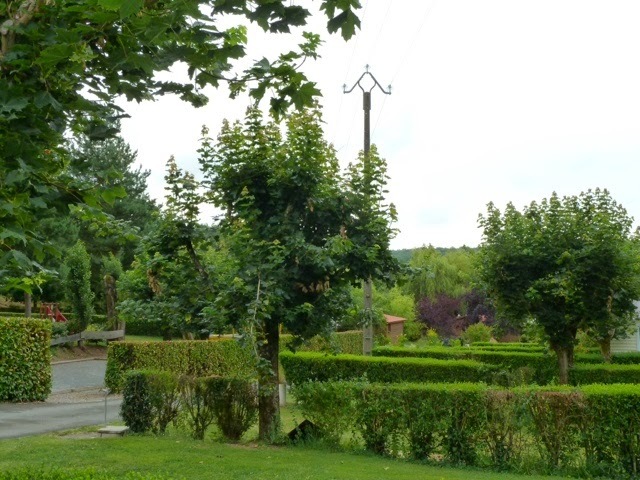 Score for Camping La Jolitiere -8/10 -nicely set out -good sized pitches with hedges and trees, good sized pool - however the shower facilities were a little dated and rustic. Couldn't fault the location though. As we drove off towards our next destination Carol spotted a wine shop on a roundabout. Les caves de St Goerges de Didonne -a mine of local wine produce - they had a special offer of buy 6 bordeaux red wines get 6 free- a bargain thinks Graham. We come across an englishmen who has a holiday home locally filling his trolley with gay abandon-apparently the white, the rose,the sparkling were very good this year- as he filled his VW transporter with his spoils! Obviously we bought a few bottles but not in his league! En route we stopped at a lovely picturesque medieval village - Vouvant. An obvious tourist magnet with a Romanesque church, lots of artisan shops, restaurants etc in a riverside location. Canoes on the river, cycles paths through the Mervent forest. 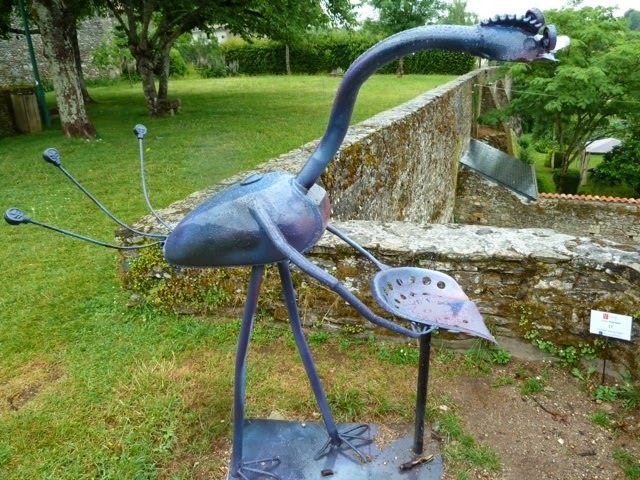 There were many kooky looking bird sculptures scattered around the village, a local artist's work. This one is also a seat! Heard more English voices today than the whole of our trip so far!-as damp looking tourists ambled through the streets. A couple of examples of the local architecture. 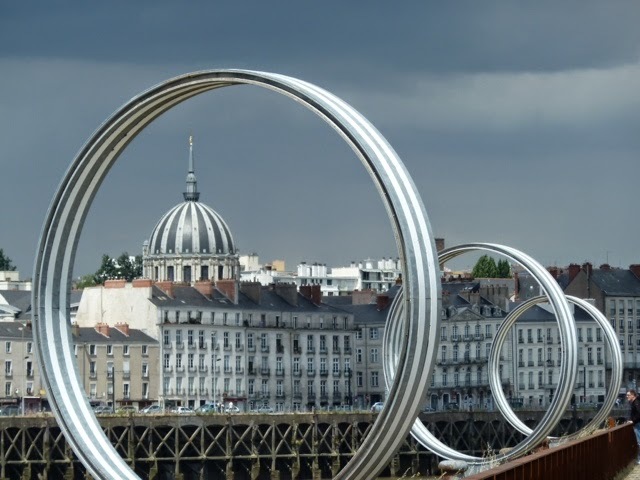 As the rain looked set in we decided to head for Nantes and take a sophisticated city break. City = nice lunch in Carol's brain. We booked in to Nantes campsite -Le Petit Port, as the rain continued to pour. Tomorrow we catch the tram into central Nantes and spend the day sightseeing - it looks like an interesting place. The campsite is well set up for us camping cars - rows of hardstanding pitches with electric hookup and water. Best of all in this weather we have a tv signal: We watch the Brasil - Chile match chez Rex with all the drama of penalties. Yes, why don't they dispense with the 90 minutes of diving and rolling and just cut straight to the drama we all want to watch: the penalty shoot out. As the match starts at 6pm local time that we are on French time now - "wine o clock" - usually 7 pm has become "l'heure du vin" - 6 pm! June 29th, Day 28. Nantes. We catch the tram just outside the campsite and arrive in central Nantes in no time. We decide to only do a couple of sights rather than tear round the place. 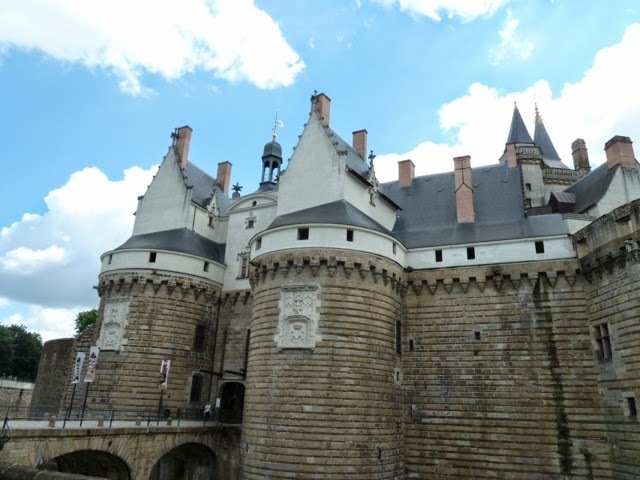 1st stop - The Chateau of the Ducs of Bretagne. 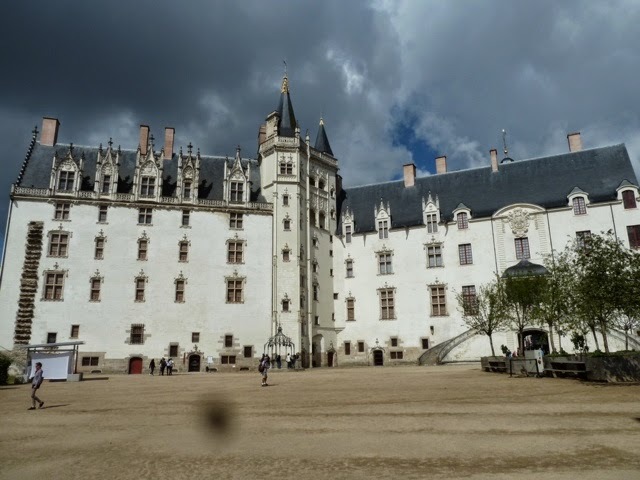 An impressive renovated ex regional palace for the king with the usual history of the building of a vanity project, followed by centuries of wars and squabbles. The inside houses a museum describing the history of Nantes which was painstakingly thorough with lots of films and descriptive text. Don't get me wrong - it's good, very good, and you could spend at least 4 hours here, but we can't help think they expanded the museum to fill the building. And anyway, lunch is calling. Sorry here's that floater again ruining the shot - but you get the gist of the size of the place! Carol was impressed with the grass like play castle at the base of the chateau. After purchasing a 24 hr tram ticket Carol decided to walk (Ed- after I'd bought a go-anywhere ticket!) across the city to the next site of choice! Graham muttering away about 4 euros wasted. Carol managed to dissuade Graham from bringing along his favoured picnic for lunch and we had a very nice 2 course lunch in a fashionable restaurant , which was again reasonably priced. 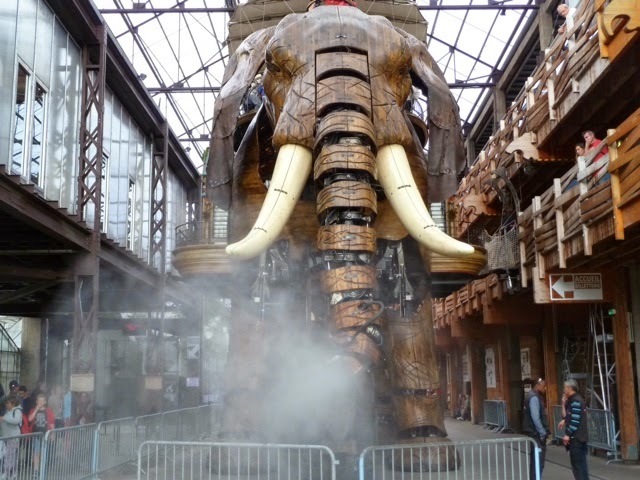 Les Machines des Nantes is situated on the old dock sites which is being regenerated into an arts quarter. One area of which contains wacky autonomic machines as if imagined by Jules Verne (who was born in Nantes). A couple of merry go rounds - one 3 stories high! Imaginery machines and creatures grace these - with moving parts that can be operated by the rider. 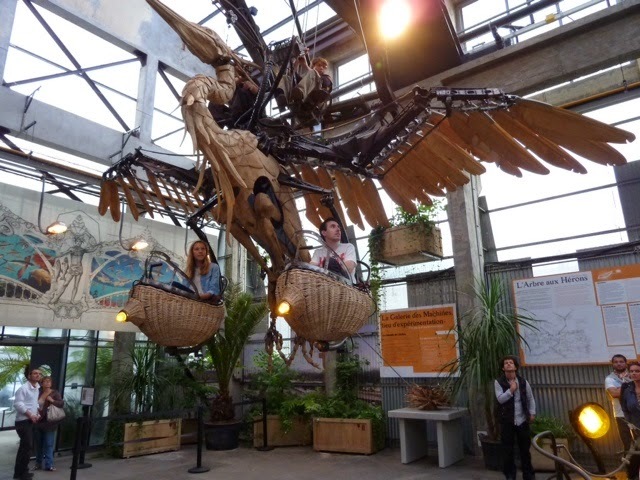 A massive deconstructed wharehouse contains further examples of creatures which children are encouraged to ride and operate. 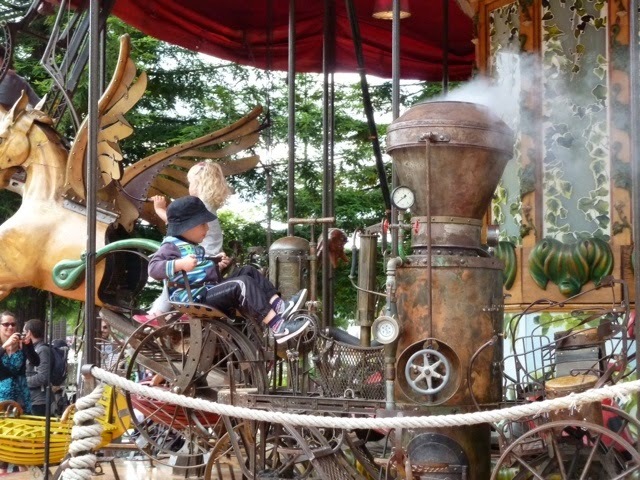 This toddler appears to be enjoying the carousel - steam pouting out of the Heath Robinson like machine he is riding! 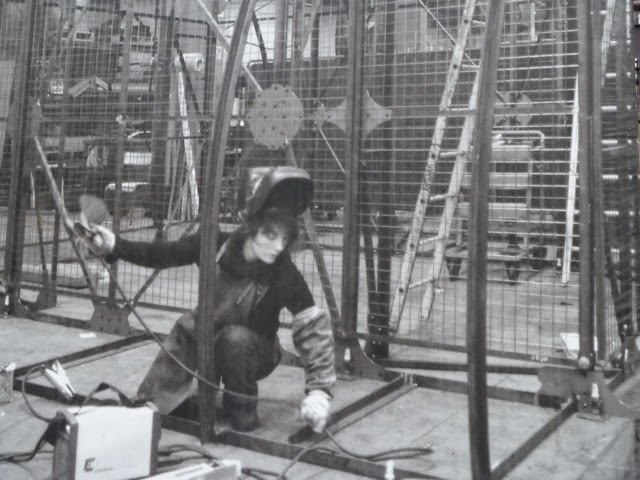 You can visit the workshops where work continues to develop and build more creations- hat's off to the architect and designers who had the vision to build this place! Graham comments that Nantes is the size of Hull and wonders if the same thing could be developed there - yeh right! Looks like a Johny Depp look alike was part of the development team! 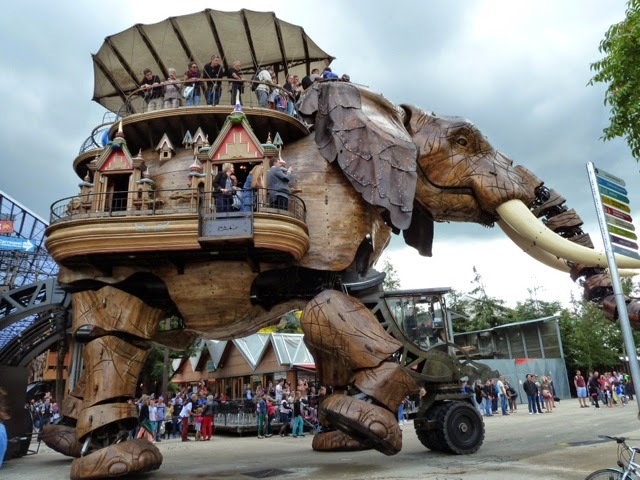 The piece de la resistance is a giant elephant which lumbers around carrying passengers and spraying water through it's trunk at unsuspecting children! It was magical! We learn the 'phant cost €6m in 2011 and carries 40 people at €8 each several times a day. The draw is enormous and has revitilised a remote dead industrial area of the city. A bit like the fruit market in Hull, I can't help but think. Nantes appeared a clean, well laid out city with the River Loire running through it.Pavements are wide and the tram network is great. Apparently it was badly damaged by allied bombing in the war and rebuilt in the 60´s. An arty view through an art installation near Les Machines des L'ille. 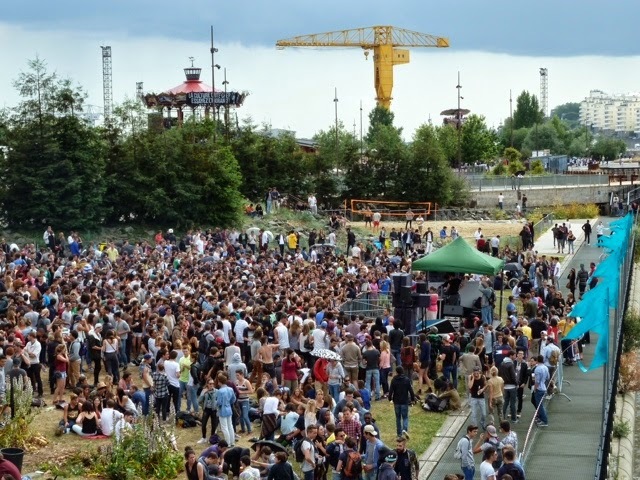 As we left the L'ille we past by what looked to be a free DJ concert on the river side. Young people were flocking there -with no apparent security noted, it was lovely to see them enjoying themselves without any sign of trouble. People were playing volley ball in the background. What a laid back fun vibe! We passed by many young people clunking along with beer/booze in their bags or carrying packs of beer - good luck to them - it must be great to be young! Actually it's not bad being retired either! We're not sure whether this is typical for a Sunday but suspect it may be the first day of school holidays and so they won't be getting up Monday morning. A bit like us, ha ha! 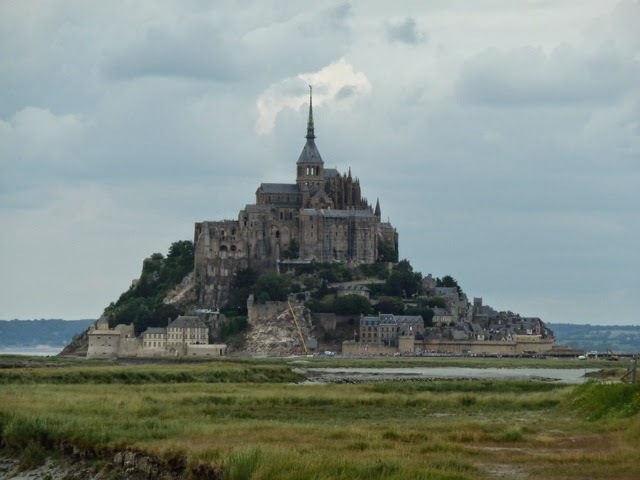 Forecast is for mixed weather so we decide on an early start and head for Le Mont St Michel which most of you will have seen or know about. It's a 12c abbey on a rock in a bay and a famous beauty spot. It's on the way and it gives us a leisurely drive tomorrow and time for some shopping at LeClerc on the way back. 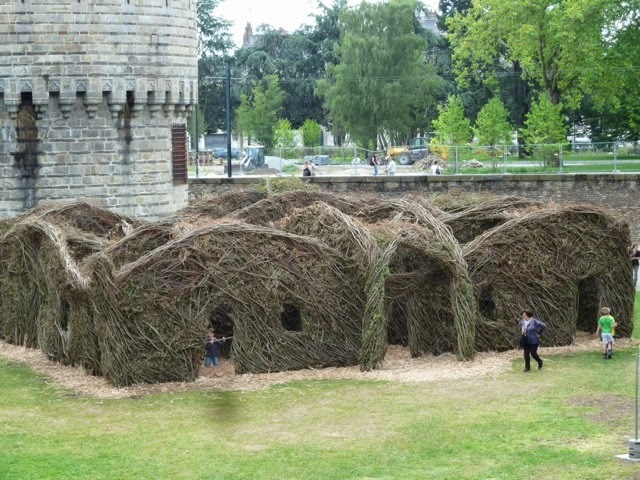 Exiting Nantes is easy and we leave with good memories of this city rebuilding itself. A baguette purchased we arrive and are directed to car park No 8. While Carol prepares lunch Graham goes back to check the small print on the car park barrier. 30 mins - free, 4 hours €21, over 4 hours €41. What! We pack up and exit within the free period and stay at Camping Aux Pommiers 2kms down the road for €14 instead, and cycle in for free. Cycling to le Mont is easy, dead flat and 15mins later we reach Le Mont. We, or at least I, am staggered. I thought this was an quaint view on a bay you would gaze at and maybe the brave few would walk to at low tide. Not a bit of it. This seems to be a top stop for coach tours ranking alongside Versailles!. There are all sorts of nationalities, mostly Americans and Chinese. 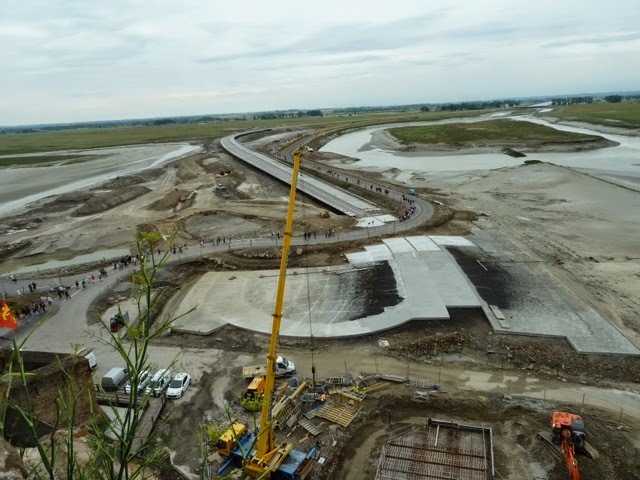 A new bridge is being built to ferry the coachload of tourists right to the door. ...and the view from Le Mont. 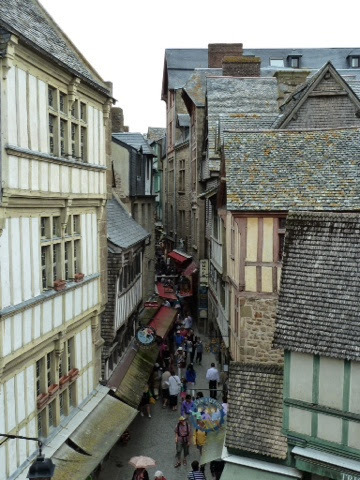 The town at the foot of the Abbey resembled a Harry Potter town scene - lots of gift shops and bar/restaurants catering for the tourists doing the hot spots of Europe tour! We walked around the ramparts and toyed with the idea of visiting the abbey museum but still reeling from Nantes overkill decided against it. Arrived back on site to visit the bar to watch the France v Nigeria match - we have adopted France as our home team for the rest of the Coup de Monde! A rather subdued audience watched France's victory. Next match v Germany! Late to awake and breakfast we appeared to be the last ones up and at 'em this morning. A leisurely drive (what else?) along the dual carriageway to Cherbourg - on arrival we decided to visit Cherbourg centre, - bad mistake! - lots of traffic, lack of signage and no parking for Rex. We manoeuvred through the streets and back out again! Decided to drive to the outskirts and do last minute shopping in Leclerc - just a few bottles of vin and other gift items and then back to Cherbourg ferry terminal. Our relaxed picnic lunch en route took place in the ferry queue! So now the end is near... writing this on the Normandie Express ferry - we will stop over at the same campsite near Portsmouth on arrival, and pick up those lost Raybans from the pub. Tomorrow we drive back up north, clean Rex and put him back in his shed.... until next time! A la prochaine! Where possible we used ACSI camping card which gave us an all in price including electric hook up. In all cases we never booked, just turned up late afternoon. We never stayed at aires. Most seem to charge at least €10 per night so we reckon the extra 4 or so euros for a pool, showers and security is well worth it. Further musings on camping a la Rex. We need an awning and a groundsheet/cover. We must think about taking a table cloth -all the best looking campers had one. We are going to investigate buying another duvet cover and putting it round the mattress topper. Then stitching elastic straps to the corner. This should save all the tucking in of the bedsheet each night and slash the time required to make the bed each night. There must be loads of market stalls around France selling toilet seats and loo roll - given the lack of both at most campsites and public conveniences. Yes -the best sites had both - but a seat in particular was a rare thing! it will take a long time before we visit any loo without a pocketful of loo roll -just in case!